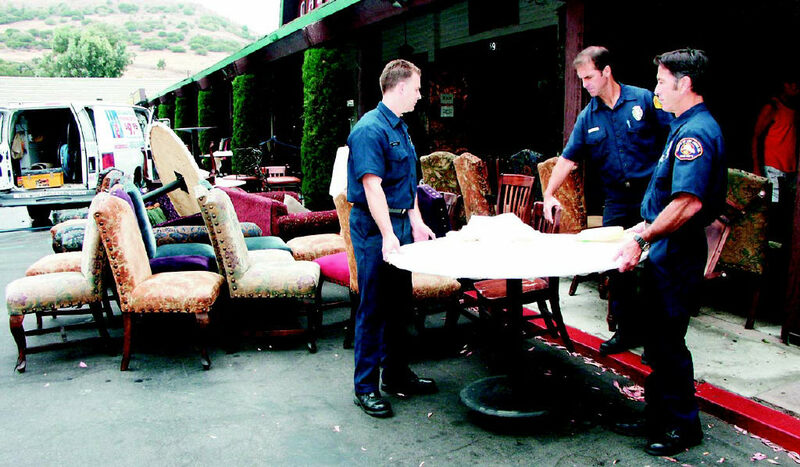 LISA ADAMS/The Acorn SERVING THE PUBLIC-L.A. County firefighters (left to right) Mike McFaul, Kevin Muno and Chris Avezzie remove furniture to minimize the damages of a flood at The Canyon, a popular nightspot in Whizin’s Shopping Center in Agoura Hills. An underground water main burst yesterday morning and flooded the facility. Lance Sterling, owner of The Canyon, vowed that it would reopen today.